In February 2013, two local Davis Islands businesses owners and residents Carolyn Bigley and Jennifer Fadal (Wag Natural Pet Market www.wagoftampa.com) partnered together to adopt Davis Islands Dog Parks, through Keep Tampa Bay Beautiful, with the intention of assisting Tampa Parks and Recreation in maintaining and improving both Davis Islands Dog Beach and Davis Islands Dog Park. Realizing that this will be a on-going and long-term community effort, they decided to form “Friends of Davis Islands Dog Parks.org”, a non-profit organization, in partnership with Friends of Tampa Parks and Recreation. It is their hopes that other local businesses and residents will join and help support park improvements, and encourage park users to volunteer and be mindful in keeping the dog parks clean and safe. Tampa Parks and Recreation repaired fences and removed hazardous materials in the parks, and made other park improvements. Volunteer groups cleaned the parks of pets wastes (which should be the job of all dog owners) and other litter that washed up at dog beach. 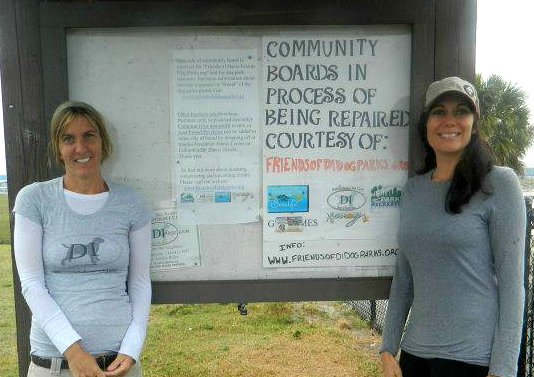 The two kiosks, (community boards at entrances of both parks) have been repaired courtesy of Big Dog Construction and will be maintained by members of “Friends of Davis Islands Dog Parks” with permission by the Tampa Parks and Recreation Dept., in order to keep the boards both informational and clutter-free.